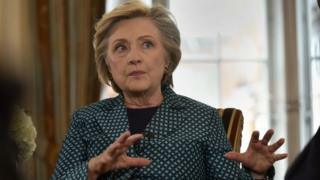 US President Donald Trump has seized on reports that Hillary Clinton's team bankrolled a sleazy dossier of allegations linking him to Russia. Claims that Mr Trump had been filmed with prostitutes in a Moscow hotel surfaced in the closing stretch of last year's White House race. Mrs Clinton's presidential campaign and the Democratic National Committee (DNC) reportedly helped fund the research. "The victim here is the President," Mr Trump tweeted on Wednesday. How did 'compromising' Trump claims come to light? According to US media reports, Perkins Coie, a law firm representing the Clinton campaign and DNC, hired intelligence firm Fusion GPS in April 2016. The intelligence firm subcontracted Christopher Steele, a former British spy who previously worked in Russia, to compile the research. Attributed to unnamed sources, it claimed that Mr Trump had colluded with Russian officials during the election campaign. The unsubstantiated dossier also alleged that Kremlin spies filmed Mr Trump with prostitutes at Moscow's Ritz-Carlton hotel in 2013. The opposition research was initially funded by an unknown Republican consulting firm, which pulled the plug once Mr Trump captured the party's nomination. The Clinton campaign then picked up the tab, according to the reports. As he headed off to Dallas, Texas, on Wednesday, President Trump told reporters on the White House lawn: "It's very sad what they've done with this fake dossier." He added: "Hillary Clinton always denied it, the Democrats always denied it. "I think it's a disgrace, it's a very sad commentary on politics in this country." In January shortly before he was sworn in as president, Mr Trump dismissed the dossier as "fake news". White House press secretary Sarah Sanders tweeted on Tuesday: "The real Russia scandal? Clinton campaign paid for the fake Russia dossier, then lied about it & covered it up." Political campaigns have been in the business of digging up dirt on their rivals since the dawn of democratic elections. A choice bit of "opposition research", deployed at an opportune moment, can be a decisive factor in a close election. So it should come as little surprise that supporters of a Republican candidate went to work building a file on Donald Trump during the party primaries or that Democrats took the baton as the general election geared up. What's unusual - and what will pique the interest of investigators and fuel the suspicions of conservatives - is that after the election, once Hillary Clinton was defeated, the FBI would pick up funding for this investigation. A topic as sensitive as this - allegations of foreign influence on a presidential campaign - doesn't seem like something the US government should be outsourcing. There have been plenty of accusations, on both sides of ideological divide, that the FBI has become politicised. Stories like this won't help diminish those concerns. In fact, they will almost certainly be cited to undermine the results of ongoing inquiries into Mr Trump's possible Russia ties, whether or not the eventual findings have a connection to this now-infamous dossier. The DNC said its new leadership had nothing to do with creation of the dossier. A spokeswoman told the Washington Post, which broke the story: "But let's be clear, there is a serious federal investigation into the Trump campaign's ties to Russia, and the American public deserves to know what happened." Earlier this week, a US judge gave Fusion GPS until Thursday to reach an agreement with congressional investigators who issued a subpoena to see the firm's bank records over the last two years. Some of Mr Steele's allegations began circulating in Washington in the summer of 2016 as the FBI began looking into whether there were any links between Trump aides and the Kremlin. Special counsel Robert Mueller and several congressional panels are investigating the same alleged connections, but to date have revealed no conclusive evidence. A few weeks ago Mr Mueller's team questioned Mr Steele about the assertions in the dossier.